Here on homify 360 we inspect many beautiful and interesting homes on a daily basis. It is not often, however that we review a project by an interior designer, and we are sure you will agree that the quality of this one has to be mentioned. 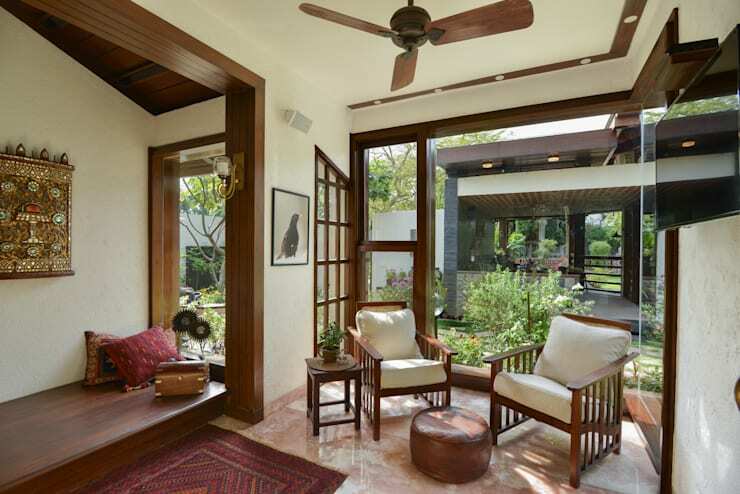 Monica Khanna Design are the interior designers beyond the Juanapur Farmhouse we will visit today, situated in Chattarpur. This modern residence has been endowed with rustic and chic elements to bring about an eclectic look for modern country living. The intense natural elements, modern features, and objects that draw inspiration from Indian art and design create an ensemble that is striking, yet calming. Does this seem like a bit of a paradox to you? Well why don’t you join us for a tour of the home and decide for yourself? The Juanapur house is a modern farmhouse in an updated contemporary style, retaining the ever-popular quintessential country look. 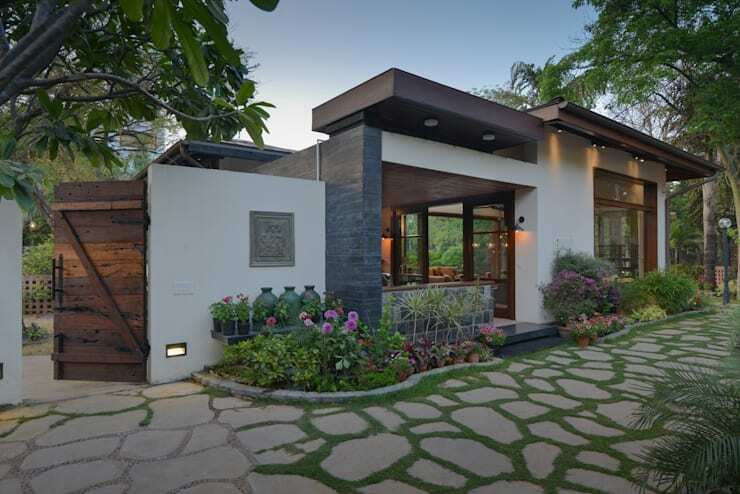 As we can see, the façade of the home is in a modern style, but there are several elements which ground the home to traditional country living, including abundant wooden features, the stone walkway, and the prolific garden. Monica Khanna Designs are based in New Delhi, India, and the lead designer, Monica Khanna, have received numerous accolades for her excellent work on projects in India, including to luxury trains. As we will see when we move on exploring the house and its interiors, its design has been greatly influenced by traditional Indian style and oriental design. This has, however, been done in a way that is not tacky or pretentious, which is often the pitfall modern designers find themselves falling into. The first step we take into the Juanapur house reveals the essence of the whole home: Simplistic with dramatic focal points. Monica Khanna Design’s website states that “the details are not the details; they make the design”. This philosophy can be seen at work here. Small fixtures and elements are really what give this space its character, but it would take time to break the design down into its particulars. Although each object has a special character and strong style, the overall composition of the room remains stable, at no point becoming disjointed or chaotic. 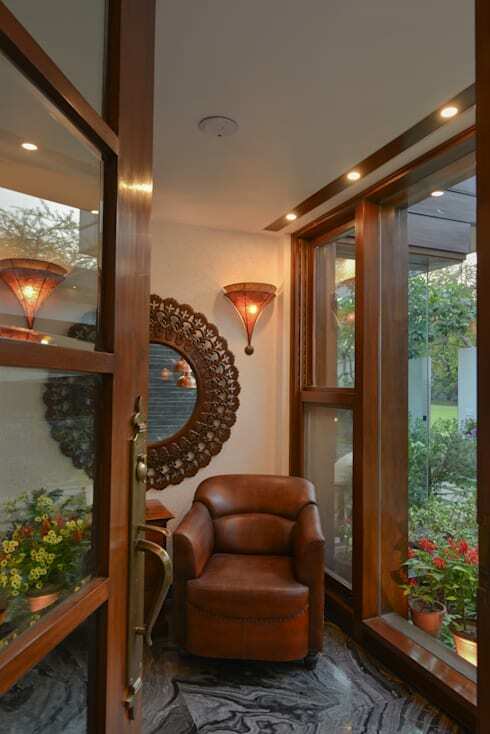 Here, the decorative design of the door handle, the polished stone tiles, the paper-thin lamp screens, and the mandala aesthetic of the round mirror are all individual details in which we can get lost in, but the overall effect is pure and simple beauty. One of the driving principles behind this project, which is also a motto of the design firm, is to produce designs that create no style barrier. This is something we can note here in this lounge section of the Juanapur home. Although there are some objects which are trendy and in line with contemporary fashion, the essential features of the room speak to good, timeless style and taste. Firstly, note the elegant and luxurious flooring of stone quartz. Isn’t it just the epitome of sophistication? The beautiful and softly rose-coloured stone is a winner, and is certainly very appropriate for this room’s style. It is complemented by wooden elements in the floor- and wall fixtures, as well as in the furniture. Some moderate textiles bring colour and warmth to the ensemble. On to yet another luxurious scene. The modest farmhouse may seem very rustic and simplistic from the outside, but the interior is just full of elegant surprises. Here we find ourselves in the bathroom of the home. It is a modern space through-and-through, with little held back when it comes to sophistication. The first thing to note is the openness of the space. The back wall, which is also the outer wall of the house, has been replaced entirely by glass. This gives a sense of openness to nature and the beauty of the outdoors, whilst also letting this sense of nature pour into the room together with the boundless sunlight. 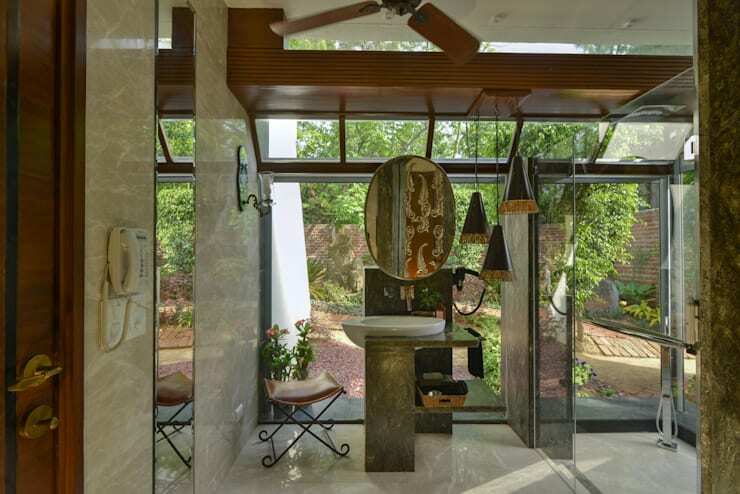 The bathroom then also hosts several large mirrors, expanding the boundaries of the room to make it feel almost limitless. The bathroom is decked in natural stone, this time in a beige, earthier colour as opposed to the other spaces we have seen before. Low-hanging ceiling lamps, an impressive oval mirror and decorative furniture are just some of the smaller details which add to the room’s imperial elegance. If you want some tips on how to create your own fancy bathroom, take a look here. Now, we have surely saved the best for last. 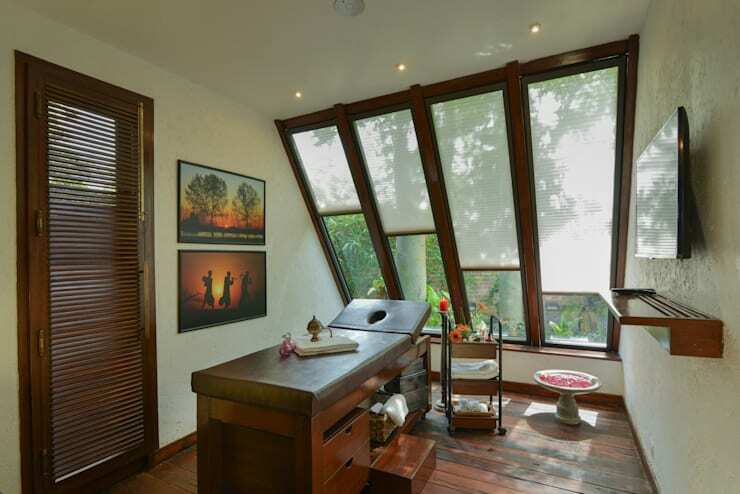 The spectacular and warm Juanapur house also has its own message room! This is certainly a treat for anyone to have in their own residence, and must make for the increased overall well-being of all inhabitants. The outward-facing wall of the room is sloped, creating an interesting effect on the dimensions of the space. This wall has also been entirely replaced by window panes, allowing as much as possible natural light to flow inside to lighten and warm the room. The design of the window panes is also as such to create an interesting and soothing rhythm in the room. The dark-wood floor is complemented by other wooden elements throughout the room, as well as the soft, brown leather of the message table to create a warm and calming atmosphere. What was your favourite part of the home? Let us know why in the comments box!